Regular posts chronicling stories of human greatness. Unfortunately, the mid-90s welfare reform was hardly enough to stem the tide of, in my opinion, unconstitutional social (make that socialist) programs and their bloat on the federal budget and our tax burden. Rank and organization: Private First Class, U.S. Marine Corps Reserve. Born 2 July 1923, Columbus, Mont. Accredited to: Montana. Citation: For conspicuous gallantry and intrepidity at the risk of his life above and beyond the call of duty while serving as a rifleman in an assault platoon of Company E, 28th Marines, 5th Marine Division, in action against enemy Japanese forces on Iwo Jima, Volcano Islands, from 19 to 21 February 1945. Quick to press the advantage after 8 Japanese had been driven from a blockhouse on D-day, Pfc. Ruhl single-handedly attacked the group, killing 1 of the enemy with his bayonet and another by rifle fire in his determined attempt to annihilate the escaping troops. Cool and undaunted as the fury of hostile resistance steadily increased throughout the night, he voluntarily left the shelter of his tank trap early in the morning of D-day plus 1 and moved out under a tremendous volume of mortar and machinegun fire to rescue a wounded marine Iying in an exposed position approximately 40 yards forward of the line. Half pulling and half carrying the wounded man, he removed him to a defiladed position, called for an assistant and a stretcher and, again running the gauntlet of hostile fire, carried the casualty to an aid station some 300 yards distant on the beach. Returning to his platoon, he continued his valiant efforts, volunteering to investigate and apparently abandoned Japanese gun emplacement 75 yards forward of the right flank during consolidation of the front lines, and subsequently occupying the position through the night to prevent the enemy from repossessing the valuable weapon. Pushing forward in the assault against the vast network of fortifications surrounding Mt. Suribachi the following morning, he crawled with his platoon guide to the top of a Japanese bunker to bring fire to bear on enemy troops located on the far side of the bunker. Suddenly a hostile grenade landed between the 2 marines. Instantly Pfc. Ruhl called a warning to his fellow marine and dived on the deadly missile, at-sorbing the full impact of the shattering explosion in his own body and protecting all within range from the danger of flying fragments although he might easily have dropped from his position on the edge of the bunker to the ground below. An indomitable fighter, Pfc. Ruhl rendered heroic service toward the defeat of a ruthless enemy, and his valor, initiative and unfaltering spirit of self-sacrifice in the face of almost certain death sustain and enhance the highest traditions of the U.S. Naval Service. He gallantly gave his life for his country. PFC Ruhl, we honor your service and sacrfice for the cause of freedom; this was your finest hour! TFH 2/20: John H. Glenn, Jr.
His path to orbit was far from certain. To that point (by my count looking at Encyclopedia Astronautica) in a minimum of 79 times that either NASA or the USAF attempted to launch an Atlas missile, 33 times the launch ended in failure. That’s a 58.2% success rate; hardly the confidence one would want to ride into space with! At 9:47:35 EST, the Atlas roared to life and four seconds later Glenn, and the hopes of a nation, were airborne. Just five thrilling minutes later, and the first free man was safely in orbit! Three times around our Earth later, Glenn prepared his spacecraft for reentry. Mission controllers had detected a problem that could lead to a disaster. Instrumentation reported that the spacecraft’s heat shield may have come loose; without its protection, Glenn and his spacecraft would be incinerated. The heat shield held (the instrumentation was later found to be in error), and Glenn splashed down safely in the Atlantic Ocean at 14:43:02. The official NASA history of his flight is found here. Throughout the rest of the Mercury program, in many ways the United States still trailed the Soviets. Glenn’s successful flight put us solidly on the road to the moon, and there was no looking back. John H. Glenn, Jr.: February 20, 1962 – forty-five years ago today – was your finest hour! Rank and organization: Sergeant First Class (then S/Sgt. ), U.S. Army, 5th Special Forces Group (Airborne). Place and date: Republic of Vietnam, 19 February 1968. Entered service at: Trenton, N.J. Born: 27 October 1942, Trenton, N.J. Citation: For conspicuous gallantry and intrepidity in action at the risk of his life above and beyond the call of duty. Sfc. Zabitosky, U.S. Army, distinguished himself while serving as an assistant team leader of a 9-man Special Forces long-range reconnaissance patrol. Sfc. Zabitosky’s patrol was operating deep within enemy-controlled territory when they were attacked by a numerically superior North Vietnamese Army unit. Sfc. Zabitosky rallied his team members, deployed them into defensive positions, and, exposing himself to concentrated enemy automatic weapons fire, directed their return fire. Realizing the gravity of the situation, Sfc. Zabitosky ordered his patrol to move to a landing zone for helicopter extraction while he covered their withdrawal with rifle fire and grenades. Rejoining the patrol under increasing enemy pressure, he positioned each man in a tight perimeter defense and continually moved from man to man, encouraging them and controlling their defensive fire. Mainly due to his example, the outnumbered patrol maintained its precarious position until the arrival of tactical air support and a helicopter extraction team. As the rescue helicopters arrived, the determined North Vietnamese pressed their attack. Sfc. Zabitosky repeatedly exposed himself to their fire to adjust suppressive helicopter gunship fire around the landing zone. After boarding 1 of the rescue helicopters, he positioned himself in the door delivering fire on the enemy as the ship took off. The helicopter was engulfed in a hail of bullets and Sfc. Zabitosky was thrown from the craft as it spun out of control and crashed. Recovering consciousness, he ignored his extremely painful injuries and moved to the flaming wreckage. Heedless of the danger of exploding ordnance and fuel, he pulled the severely wounded pilot from the searing blaze and made repeated attempts to rescue his patrol members but was driven back by the intense heat. Despite his serious burns and crushed ribs, he carried and dragged the unconscious pilot through a curtain of enemy fire to within 10 feet of a hovering rescue helicopter before collapsing. Sfc. Zabitosky’s extraordinary heroism and devotion to duty were in keeping with the highest traditions of the military service and reflect great credit upon himself, his unit, and the U.S. Army. Thank you, Sergeant First Class Zabitosky for your service; this was your finest hour! January 1945. Entered service at: Wilkinsburg, Pa. Birth: Braddock Township, Pa.
First Sergeant Leonard A. Funk: January 29, 1945 in the face of the enemies of freedom, was your finest hour! My first source of honorees for “Their Finest Hour” is Medal of Honor citations. Today’s installment of TFH deals with an individual who needs no introduction: Audie L. Murphy, the most decorated U.S. Soldier in World War II. He enlisted in the Army when he was underage, fought with incredible courage, and later became a movie star. Audie L. Murphy was tragically taken from us before his time on May 28, 1971 in a plane crash at age 46.
which had been the enemy’s objective. Audie L. Murphy: January 26, 1944 near Holtzwihr, France – conduct above and beyond the call of duty in the face of enemies of freedom – was your finest hour! Ok, I know, I’m off by a day (darn Wikipedia using GMT to time/date everything! ), but in any case the story of the successful landing, and subsequent much-better-than-anybody’s-dreams performance, of NASA’s two Mars Exploration Rovers is the subject of today’s installment of TFH. MER-A, Spirit, successfully landed on Mars on January 3, 2004. Its sibling MER-B, Opportunity, landed on the red planet on January 24, 2004. Successfully landing on Mars is a big deal; many spacecraft – Mariner 3, Mariner 8, Mars Observer, Mars Climate Orbiter, and Mars Polar Lander just to name a few – have all been lost at some point on their journey. Building on the successful landing of Mars Pathfinder on July 4, 1997, engineers at NASA’s Jet Propulsion Laboratory enhanced the Entry, Descent, and Landing (EDL) systems for use by the MERs. This amazing system of heatshield, parachute, retrorockets, and airbags safely delivered both Spirit and Opportunity to the Martian surface, where they are both still exploring three Earth years later! If you’d like to learn more about what it took to get Spirit and Opportunity to Mars, and how they’re still roaming the surface today, check out the main website, but also look at the video clips on this page, particularly the ones for navigating to Mars, and “6 Minutes of Terror” – the story of Entry, Descent, and Landing. This story is even better because both MERs were only designed for a 90 sol (e.g. Martian Day) life span. Spirit will enter its 1,090th sol in the next day; Opportunity is at 978 sols. Getting to Mars safely is a huge achievement. The Mars Exploration Rovers are a national triumph. My congratulations go to all those who have worked on these amazing exploits! However, for navigation engineers Lou D’Amario and Darren Baird (seen in the “navigating” video) – and for EDL engineers Jaime Dyk, Wayne Lee, Rob Manning, Tom Rivellini, and Adam Steltzner (all appear in the “EDL” video) – along with all your other colleagues who were involved with getting the rovers down to the surface, the safe arrivals of Spirit on January 3, 2004 and Opportunity on January 24, 2004 were your finest hour! In keeping with the title and spirit of my blog, I am going to endeavor to post daily about one individual or group for whom the date was “Their Finest Hour”. To kick this off, I have found a great one: Robert Stephenson Smyth Baden-Powell, 1st Baron Baden-Powell, who on January 24, 1908 founded the Boy Scout Movement! I had many great experiences myself in Scouts, including two trips (1987, 1988 Rayado) to Philmont Scout Ranch. If there is one regret of my adolescense, it’s that I didn’t quite make it to Eagle Scout. The contributions of Scouting to our world, in the development of leaders, and the building of individual character in young men is without question. The Scout’s Oath: On my honor, I will do my best to do my duty to God and my Country; to obey the Scout Law; to help other people at all times; and to keep myself physically strong, mentally awake, and morally straight. And yes, I can still do the oath and law from memory! Both the Boy Scouts of America and the World Organization of the Scout Movement are being placed under “Sites on My Mind”. Lord Robert Baden-Powell, establishing the Scouting movement was your finest hour! At 0753 local time, the Japanese attack on US Forces at Pearl Harbor and elsewhere in the Hawaiian Islands began. 2,403 American servicemen and civilians gave their lives in defense of our country that day. Fifteen were awarded the Medal of Honor. In that “Day of Infamy”, it was their finest hour. Japanese admiral Isoroku Yamamoto – the architect of the Pearl Harbor raid – commented after the attack, “I feel that all we have done is to awake a sleeping giant and fill him with a terrible resolve.” He had that right. our people – we will gain the inevitable triumph – so help us God. It is 65 years today since the Pearl Harbor attack. It is just over five years since 9/11. Are we sleeping again? On the morning of September 11, 2001 I was at home. My first appointment of the day wasn’t until 10:30, so I was checking e-mail and listening to KDKA radio when the news bulletin came over the air that a plane had crashed into the World Trade Center. Like most, I assumed initially that it was probably some freak accident with a small plane. A few minutes later, when I turned the television on, assumption turned to disbelief. Not long after, disbelief turned to horror as I watched the second plane hit WTC2 live. While all this was unfolding before us, New York’s finest of the Fire Department and Police Department were beginning the largest rescue in history. Among them were the fire fighters of Ladder Company 13, who share a fire house at 159 E. 85th Street with Engine Company 22 and Battalion 10. With the gallant fire fighters of Ladder 13 was my honoree, Gregory M. Stajk. FF Stajk was 46 years old. According to published sources Mr. Stajk, a bachelor, was beloved by his comrades – he was always willing to work holidays and extra shifts, to give other fire fighters with wives and children time with their families. 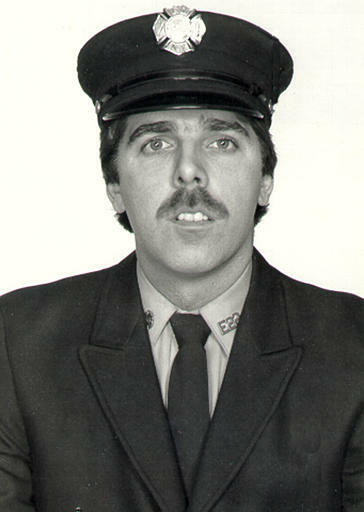 FF Stajk was a 19-year veteran of the FDNY. All five members of Ladder 13 who responded on that infamous morning were lost. The others with Gregory Stajk were: Captain Walter Hynes, FF Thomas Hetzel, FF Dennis McHugh, and FF Thomas Sabella. Four members of Engine 22 also gave their lives to save others: FF Thomas Casoria, FF Michael Elferis, FF Vincent Kane, and FF Martin McWilliams. (links are to the 2,996 Project sites for those individuals’ tributes). On this, the fifth anniversary of 9/11, please pray for our Nation, the victims of the attacks, and for all the fire fighters, police officers, EMTs, paramedics, soldiers, sailors, Marines, airmen, and coastguardsmen who daily risk their lives for the safety of the rest of us, and our way of life. God Bless you Greg. For your sacrifice, I am forever grateful. 9/11 was your finest hour. This will be my only posting today. The memory of Firefighter Gregory M. Stajk, FDNY and the other 2,995 souls taken on September 11, 2001 should stand alone.